The 2019 Treadmill Buying Guide! Once you know what you want, take advantage of our coupons and save! Finding a new treadmill can be both an exciting and frustrating experience. The exciting part is looking at the treadmills and imagining the treadmill in your own home. However, frustration can mount as you realize just how many treadmills are on the market. From well-known brands like NordicTrack and Sole to treadmill manufacturers you have never heard of outside of Amazon, it is incredibly difficult to sort through the thousands of treadmills available. Here at Treadmill Reviews, we understand there are an overwhelming amount of treadmills to choose from when looking for a home treadmill. We have spent hundreds of hours researching, testing, and writing reviews on treadmills and it can feel overwhelming to us at times! With the time we’ve spent working with treadmills, we have formulated a comprehensive treadmill buying guide which we would like to share with everyone looking for their next treadmill. Then, once you have found your perfect treadmill, be sure to take advantage of our exclusive coupons so you can capture some savings while investing in your health. There are many aspects to consider when it comes to selecting a treadmill. The perfect treadmill for a retiree is generally not the right treadmill for an active early thirties professional. To help you navigate our guide more easily, we have broken our review into two sections. The first section “Treadmill Buying: Where To Begin” has been designed to help you sort through the sheer amount of treadmills out there and to create a short-list of treadmills you are interested in. In our second section “Treadmill Anatomy: Deciphering Treadmill Specifications”, we go over what the different specifications of a treadmill mean for you the users, without all the sales hype that you find when looking at treadmills. It is only natural to start your treadmill search by setting your treadmill budget. You don’t want to fall in love with a particular treadmill only to realize you can’t afford it. So we recommend that you consider your price range before you start hunting for a treadmill. We rate treadmills according to a basic range of budgets. Thanks to years of research, we’ve found that treadmills in specific price ranges come equipped with many of the same features. Under $500 – There are currently no treadmills we can recommend in the under $500 price range. We have found that these treadmills are generally made with inferior parts and do not last over a year. If we do find a good treadmill in this price range, we will update our guide. Between $500 – $700 – This is the lowest price range we have been able to find worthwhile treadmills. They tend to have a max speed of 10 MPH and incline range of 0% to 10%. You also tend to find warranties a bit shorter in this price range. Users hoping to use a treadmill in this price range for years should stick to walking and very light jogging. Be sure to check out our recommended best treadmills between $500-$700. Under $1,000 – You can find a wide variety of good treadmills for just under $1,000. There is a clear jump in cushioning quality on these treadmills, many which come with patented cushioning technology. You will also find they can reach the max speed of 12 MPH, though some still only reach an incline of 10%. These treadmills are best for walkers and joggers. They may not last as long if you are a regular runner. Be sure to check out our recommended best treadmills under $1,000. Under $1,500 – Most of our testers are active people and have found that the $1,500 price range is where they can find treadmills to suit their active lifestyles. We like to refer to these treadmills as the “people pleasers” as they are at a great price and can accommodate people with a wide fitness range. Walkers can enjoy a variety of programs and runners finally have a machine that can keep up with their drive. Be sure to check out our recommended best treadmills under $1,500. Under $2,000 – Once you move into this price range, you will find treadmills with more “extras”. Things like touch screens, 35+ workout programs, and incline ranges of 15% are some of the common treadmill extras you receive in this price range. These treadmills tend to be highly durable and constructed with heavier frames so that your treadmill can last you for years to come. Great for walkers, joggers and runners, we like to recommend this price range if you have a household that will have multiple treadmill users who will utilize the treadmill on a daily basis. Be sure to check out our recommended best treadmills under $2,000. Under $2,500 – Most of the treadmills in this price range fall into the light commercial quality range. This means they are up to heavy usage; not quite commercial gym-quality but perhaps a small office gym or hotel gym. There is a big jump in quality and options when it comes to this price range, where you can customize things like your console type and program add-ons. 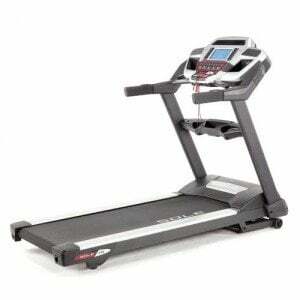 You can also find specialty treadmills in this price range, like NordicTrack incline trainers. Be sure to check out our recommended best treadmills under $2,500. If you do find that your perfect treadmill is out of your set budget, many of the top treadmill manufacturers have financing options. Brands like SOLE and NordicTrack offer 18 months free of interest, so be sure to consider financing if your perfect treadmill is out of your budget. Once you have determined what you plan on budgeting for your new treadmill, you should consider your size restrictions. Many of the better quality treadmills are also fairly bulky. This helps them maintain greater stability when they are in use. However, it does mean you will need to pay attention to the space you have available for a treadmill. In general, the size of your treadmill will depend on the cost. An example of this is the Horizon T101 treadmill. Compare that to the SOLE F85, which is another great treadmill option. When you are short on space, those inches of difference between the treadmills sizes can make a big difference. Even if you have an area in your home for a home gym, you will still want to make sure your treadmill fits well into the area you have set aside for it. If you have dedicated space for a larger treadmill, you may be interested in some of the non-folding treadmills on the market. These are usually specialty treadmills with heavy-duty frames with high incline ranges that don’t allow for folding. For your average treadmill, treadmill manufacturers have added a folding mechanism into their treadmills’ designs. We make sure that all of our reviews specify if the treadmill folds or not. A helpful innovation for folding treadmills is the hydraulic system many treadmill manufacturers have added to their treadmills. The hydraulic allows the deck to be raised more easily and also lowered without you needing to keep a firm grip on it. Quite a relief for those who dealt with older treadmills without the hydraulic system! Be sure to check out our recommended best folding treadmills. We recommend that you take a measuring tape to the area you have set aside for your new treadmill and writing down the width, length, and height of the space. That way you can quickly eliminate treadmills which do not fit into the space you have available. It may seem odd that we have placed your needs vs the treadmill’s ability as the third-place consideration. But when you consider just how many treadmills are currently available on the market, it is important to take care of your budget and space considerations before anything else. That way you have a tool to quickly eliminate treadmills which do not fit into your basic requirements. Senior, low activity level – For many of these users, we tend to recommend treadmills the more affordable treadmill price ranges. These users will likely not go over 6 MPH and while incline can add challenge to their workouts, it also can represent a danger if they are not steady on their feet. So a treadmill costing between $600 to $1,000 will be fine for these users. Senior, high activity level – More seniors are entering their golden years while maintaining a high level of activity. To help support their continued fitness, we like to recommend treadmills ranging $1,000 to $1,500. Treadmills in this price range generally have good cushioning on the deck while still being up for a user who will jog and break into a run. Out-of-shape, looking to become fitter – Working out from the comfort of your own home is a great way to start a fitness journey. While it is tempting for those who have previously had low activity level to just buy a budget treadmill “to see if they stick with it”, it is self-sabotaging as it practically predicts that the user will give up. We like to recommend treadmills in the just under $1,500 price range as they tend to have a great mix of entertainment, a variety of workout programs, and high durability to keep up with the user as they progress. For users starting at weights higher than 300 lbs, we particularly recommend the SOLE brand treadmills as they have some of the highest user weight capacities, reaching 400 lbs. Previously active, post-injury – For those who were previously active, it can be hard to start working out again. Depending on the injury, you may have new limitations. Once your doctor has approved you for exercise, you will want to find the right treadmill to support your renewed activity. Some our testers have been rehabbing injuries as they tested out treadmills for us. Overall, they found the treadmills priced at $1,500 and above have superior cushioning than the budget treadmills. These treadmills can also then accommodate you as you recover and want to push your workouts harder. Active, supplemental runner – We classify a supplemental runner as someone who uses running to improve their main sport. An example is someone who prefers weight lifting but knows they need to add cardio to their workouts. As they are already active and can push more than other treadmill users, we like to recommend treadmills in the $1,500 to $2,000 price range. These treadmills have a larger workout program bank for users to stay challenged, heavier and more durable frames, and longer warranties. Active, training – Once winter hits, running outside can become an exercise in misery. Other weather conditions can also impair runners who need to train, such as high heats and lightning storms. For those who are active, high volume runners who put in 50+ miles a week, we like to recommend treadmills in the $2,000 to $2,500 range. Many of the treadmills in this price range are classified as light commercial, which is the level of durability high mileage treadmill runners will need. Your height and weight can also affect what treadmill is the right one for you. Treadmill manufacturers create treadmills based on the average size ranges of the population. So if you are an outlier, you may need to pay closer attention to the specs of a potential treadmill. Height – Our treadmill testers range in height from 5’1” to 6’4”, so we have developed a fair approximation of how treadmills work for a variety of heights. On average, you will not need special considerations if you are under 6’ tall. If you are taller than 6’, you will want to make sure that your treadmill belt length is at least 60” long. Shorter than that and you may not feel comfortable doing more than walking. Weight – On average, treadmill manufacturers like NordicTrack and ProForm have treadmills with a max weight capacity of 300 lbs. Horizon and SOLE have treadmills rated for higher weights but SOLE is the one which has treadmills rated for users weighing up to 400 lbs. Once you have determined what range of treadmills you are interested in, you will still likely have a large variety to choose from. To help you narrow down that list, consider what treadmill extras are worth it to you. Workout programs – Plenty of people hop on to a treadmill and only use the manual function. When it comes to cheap treadmills, many of them only have a manual function. However, if you want to push yourself or just have someone else take charge of your workout, then workout programs are a great option. Automated features – Some treadmills have automated features such as autobreeze, which adjusts the fan speed to the intensity of your workout. Wireless heart rate monitoring – Many treadmills on the market currently have EKG heart rate monitoring handlebar grips. However, these handlebar grips are a notoriously inaccurate way to monitor your heart rate. To combat this, the better treadmill manufacturers have included wireless heart rate monitoring capabilities in their treadmills by creating a wireless, adjustable chest strap with which you can monitor your heart rate. Sometimes the chest strap has to be bought separately from the treadmill and at other times, the chest strap is included in your treadmill purchase. High incline range – On average, good treadmills have an incline range somewhere between 0% to 15%. Some have decline features, which these treadmills generally start in price just under $1,500. But for those looking for a greater challenge, and/or to burn calories faster, a higher incline range can be a great benefit. 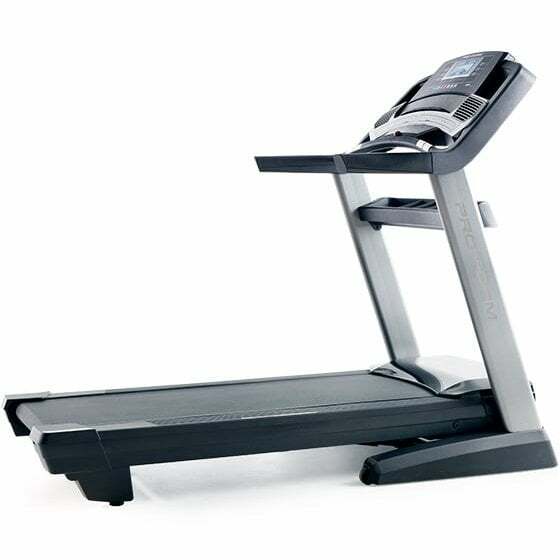 Currently, the highest incline ranged treadmill on the market is produced by NordicTrack. These incline trainers can decline to -6% and incline up to 40%. All while performing all the other functions of a normal treadmill. Entertainment options – Many people find it an absolute drag to workout on a treadmill. To help lessen the feelings of boredom, many treadmills have entertainment options. Cheap treadmills may just have some speakers and an audio jack so you can blast your music while you workout. However, from treadmill innovators like ProForm, you can use a 22” touchscreen console to workout with a virtual personal trainer. Bluetooth – For those who want to track their workouts so they can sync it with other fitness apps like MyFitnessPal, Fitbit, and other fitness tracking apps. Also, the top treadmill manufacturers have their own apps which can sync with your treadmill to improve your experience. Apps like SOLE Fitness and ViaFit are purely for workout tracking and interfacing more easily with your treadmill. iFit – This app syncs with several treadmill brands as it is produced by ICON. From the popular gym equipment producer Freemotion to top home gym equipment brands like ProForm and NordicTrack, iFit can add to your treadmill workouts. It is a paid app which offers nutritional coaching, access to virtual courses around the world thanks to a partnership with Google Maps, workout videos, and unlimited personalized workouts which are based on your goals. Sprint 8 – On some of the Matrix, Vision, and LifeSpan treadmills, an interval HIIT program called Sprint 8 is programmed into the console. In 20-minute long workouts, you will sprint for 30 seconds then have 90 seconds of active recovery. Passport – Some treadmills are enabled with Passport, which is an innovative piece of workout technology. Purchased separately from your treadmill, the Passport player will allow you to take virtual runs through places like New Zealand’s beaches, the French Riviera coastline, and more. No one likes to think that their treadmill may need to be repaired. But, considering the wear and tear treadmills undergo over the years, it makes sense to have a good warranty to cover your investment. This is the average length you should expect in treadmills priced from $1,300 to $2,000. Budget treadmills will naturally have slightly shorter parts and labor warranties but you should always have a lifetime frame and motor warranty. As these parts take on the greatest wear and tear, you will want to be sure that they are completely covered. We do not recommend third-party warranties when it comes to purchasing your treadmill. In many cases, these third-party warranties do not cover more than the manufacturer’s warranty. After you have created a short-list of treadmills which have caught your interest, there are a couple of ways to investigate them before you buy. Testing in stores – When investing in a new treadmill, it is natural to want to become familiar with the treadmill in-person before you buy it. There is a variety of pros and cons when it comes to testing treadmills in-store. Reading/watching reviews – Rather than rely on the limited selection of treadmills available in stores or the description of the treadmills on their websites, you can turn to online treadmill reviews. Between in-depth, written treadmill reviews and videos treadmill reviews, they should help you decide which treadmill is the right one for you. Once you have reached the purchasing stage, congratulations on finding the right treadmill for you! There is still one more step to consider before you buy your treadmill, which is are you going to buy it from a brick and mortar store or online. Buying in stores – As brick and mortar locations lose ground to online shopping, this will naturally affect your in-person treadmill shopping experience. Also, since treadmill manufacturers do not have physical storefronts, you will be working with third-party vendors if you purchase a treadmill in-person. Buying your treadmill online – When it comes to buying a treadmill online, we will almost always recommend you buy directly from the treadmill manufacturer. You will have a better customer experience which will help from the moment you place your order to the time where you may need to call for warranty-covered work. We do encourage you to take advantage of coupon deals as long as they allow you to buy directly from the manufacturer. Here at Treadmill Reviews, we like to dig deep into our favorite topic — treadmills. For those who also like to conduct deeper investigations, we have developed our “Treadmill Anatomy: Deciphering Treadmill Specifications”. In this section, we will explain what all the numbers and slightly vague treadmill specs mean. When it comes to treadmill motors, it can seem like treadmill manufacturers are just throwing out numbers and acronyms. The two you will see associated with the treadmill’s strength is HP and CHP. Horsepower – A motor which is measured via horsepower (HP) has only measured the top strength of the motor. This shows no evidence of how strong the motor stays over time. Not considered a reliable measurement of treadmill motor strength. Continuous Duty horsepower – When the continuous duty horsepower (CHP) of a treadmill motor is assessed, the measurement is taken over an extended period of time. It shows that the motor can maintain the power it is rated for without lagging or slowing down under strain. Generally considered the most reliable way to measure treadmill motor strength. Now that we have clarified what the acronyms mean, you probably want to know what the various numbers mean to you, the potential user of the treadmill. 1.0 CHP – Only cheap treadmill have a motor in the 1.0 CHP range. We do not recommend any treadmill with a motor of this size. It can really only accommodate walkers and likely will not last long under any greater stress than a casual walker. 2.0 CHP – Treadmill motors in this range are best for walkers and light jogging. The small size of these motors generally makes them quieter than larger treadmill motor sizes. You tend to find motors of this size range in budget treadmills. 3.0 CHP – If you are looking to run regularly on your treadmill, you will want a treadmill in the 3.0 CHP size range. They have the strength to keep up with your workout and not slow down. This is a good size for families who will have multiple users of varying fitness levels. 4.0 CHP – The top treadmills of the home treadmill market have 4.0 CHP motors. These treadmill motors are able to keep up with serious runners who make high physical demands on their equipment. 5.0 CHP – Not generally found in treadmills available on the consumer market, treadmills with 5.0 CHP motors can be found in commercial gyms and health clubs. The standard max speeds of most treadmills falls between 10-12 MPH. Some specialty treadmill can go faster, but they generally not available for the average consumer. However, most treadmill users will never use the top speeds of their treadmills. To help contextualize the treadmill speeds, we have broken down the speeds into what they mean for the average user. 1-3.9 MPH – This is the walking speed for most users. You can burn fat at this pace and is considered moderate exercise if you are walking briskly. 4-5.5 MPH – A light jogging pace for the average user, with the lower range being more of a brisk walk. All of this will fall in the moderate exercise range and is a fat burning activity. 5.6-8 MPH – In this speed range, you will reach aerobic exercise territory. At these speeds, your workouts will be considered vigorous exercise. Most treadmill users will not use speeds beyond this range. 8.5+ MPH – Most runners cannot maintain speeds at 8.5 and above. Your body will be in anaerobic territory when running at these speeds, which is good for short periods of time. If you are looking to boost your workouts and challenge your body, then you will want a treadmill with a good incline range. Whether you are a walker or a runner, you can benefit from adding incline to your workout. Another excellent benefit is that you will burn calories faster when working out on an incline. We even put the NordicTrack incline trainer claim (that you can burn calories 5 times faster at a 40% incline) to the test. While our testers didn’t burn calories exactly 5 times faster, it was close enough to be impressive. We would recommend you be wary of treadmills with a high incline range and a short track. If you are going on an incline over 10%, you will want to have a treadmill belt length measuring 60 inches at least. One of the major assets of choosing to use a treadmill is that it is easier on your joints rather than running on other surfaces. However, all treadmills have their own level of cushioning which will affect your experience. It is difficult to assess how comfortable or uncomfortable a treadmill deck is as it can differ from user to user. One way to identify superior cushioning is to look for patented cushioning technology. It generally indicates that more care has been taken when it comes to that aspect. Some treadmill manufacturers like NordicTrack even allow you to manually adjust the cushioning level of your treadmill so you can make it perfect for you. 20×55 – Good for walkers and some light jogging, maybe a bit short for runners or those who are over 6’1”. 20×60 – Is the standard length for better treadmills and is good for walkers, joggers, and runners. 22×60 – Ideas length and width for runners and users who utilize high inclines. There are many ways to refer to treadmill belts: walking belt, treadbelt, running belt and more. They are all treadmill belts and have no difference in anything but name. However, there are some differences you can find between treadmill belts. Belt ply – Ply refers to the thickness of the treadmill belt. A 1-ply belt is decent enough for a home use treadmill, especially if it is just for walking. Few of the top treadmill manufacturers will make a treadmill with a belt thinner than 2-ply. A 2-ply belt is considered commercial quality. Stretch – You will want a non-stretch belt as this kind of belt will be less prone to developing slack. If the treadmill you are interested in doesn’t have the stretch listed, be sure to contact the sales department to inquire. Roller size – The size of the treadmill’s rollers also affect the lifespan of the treadmill belt. Larger roller diameters means less wear and tear on the treadmill belt. Even though the best treadmills have lifetime warranties on their frames, you don’t want to choose a treadmill with a weak or wobbly frame. There are some ways you can identify the strength of your potential treadmill’s frame. Weight of the treadmill – Some treadmill manufacturers understand that their heavier treadmills can be difficult to move. Be sure to read reviews to gain a good understanding of the ease of movement for heavier treadmills. As a rule of thumb, budget treadmills are generally lighter and easier to move around. Amount of wheels on the treadmill – The wheels of a treadmill can make or break the portability of your treadmill. If the treadmill has 6 wheels then they can generally be moved while upright without tilting it. It can sound impressive when a treadmill comes with a large number of workout programs. But the tough part can be knowing whether or not these programs are valuable for you. Treadmill reviews can help elaborate on what kinds of programs are available on the treadmill you are interested in. Also, be sure to check the treadmill manufacturer’s page for the particular treadmill you are interested in purchasing. The page will generally have some brief information on the workout programs. Somewhat negligible features on a treadmill are the accessories. While they add to the comfort and overall treadmill experience of the user, the accessories may be the least important part of the treadmill’s anatomy. Holders – Many treadmills have a variety of holders built into them. From water bottle holders to device trays, the better treadmills generally have more holders than any user may need. Audio – Standard on most decent treadmills is a sound system in the form of speakers and audio jack. Better treadmills have Bluetooth so you can sync your phone and play your music wirelessly. Tablet holders – Many treadmills have a tablet holder mounted above the console. That way you can have access to entertainment while not covering up the treadmill display. USB port – A less common feature on treadmills is a USB port. We particularly like seeing these charging ports on treadmill desks like NordicTrack’s Treadmill Desk Platinum. Last but not least are the safety features on a treadmill. Many users neglect the clip-on safety key which is usually magnetized to the console. Cheap treadmills may just use a key which must be plugged into the console. This key must be in place or the treadmill will not start running. Be sure to have it clipped on to you so if you have an accident while using your treadmill, it can be dislodged and stop the treadmill instantly. You’ve made it to the end of our comprehensive treadmill buying guide! We hope we have been able to help as you search for that perfect treadmill. Be sure to capture some extra savings by using our exclusive treadmill coupons.